Chrichton's World: Review The Lost Boys (1987): A classic through and through! Review The Lost Boys (1987): A classic through and through! The Lost Boys is one of those movies that had quite the impact on me when I watched it. Like most films made in that wonderful decade. It's so tied to the Eighties that it would lose it's charm when set in another time. But apart from that there were a few other factors that made this film a classic. The actors. Corey Haim, Corey Feldman, Kiefer Sutherland, Jamie Garland, Jason Patrick and many others took the material serious and were essential into making the world they live in believable. In my opinion Jason Patric is underrated since for some reason I always found his character and what he has to go through very compelling. I also liked the dynamics between him and Corey Haim. Especially one very hilarious one. Corey Feldman and Jamison Newlander as the Frog Brothers were quite aggressive and unrelenting. Their dislike for the bloodsuckers was huge. While they mean well they sometimes come across as real villainous. Kiefer as David sure did his best to be very mysterious and creepy. And yet he is a very tragic figure as well. Yes there is a lot of comedic relief but at the same time the film doesn't spare us the blood and gore. Although it's mostly done in stylish manner so that it's not that shocking or gross. However you do feel the impact of certain events and that is what matters. 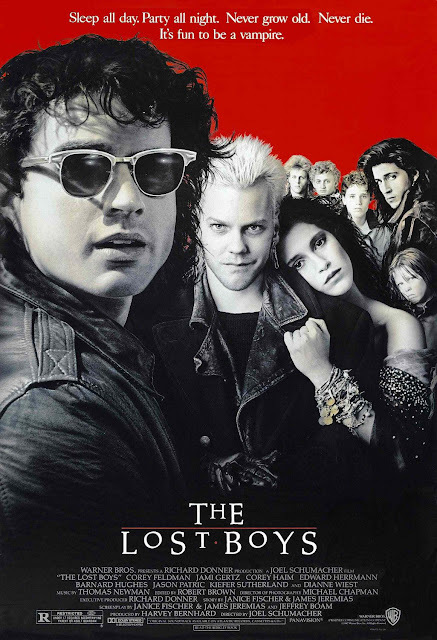 For first time viewers The Lost Boys might even be a very suspenseful affair since some mystery elements play a vital role in the story. Director Joel Schumacher has put in some real clever misdirections to keep you guessing until the very end. But even on multiple viewings you'll find out that a lot of attention is put on buildup of atmosphere and symbolism. And a big case can be made for gay undertones that you might have missed the first time when watching. For example Sam (Corey Haim) has a poster of Rob Lowe hanging in his room. Something I hadn't really noticed before. But in my latest viewing I did and it made me wonder why a boy would hang up a picture of another young man especially if it's a picture you usually would see teen girls drooling over. Or the less subtle homo eroticism between the lost boys. But that is not uncommon for vampire movies. For me it was the music that sold me. Some of the songs I could listen to over and over again and never get tired of. One of them is the iconic Cry Little Sister by G Tom Mac. It's hauntingly beautiful in it's original form but also has some dramatic impact in crucial scenes. And how can you forget Tim Cappello's I Still Believe which is brilliantly parodied on SNL by John Hamm. Last but not least The Lost Boys is a lot of fun. I must have seen this fifteen times by now and I could pop in the Blu Ray right now and watch it all over again. A classic through and through.